We recently spoke with Kim Sullivan, SVP, CMO of the Event Planners Association. Kim founded the Event Planners Association in 2005 as a way to help event planners and independent business owners in the entertainment industry. Described as a “one-stop” shop, the EPA assists their members through their in-house insurance agency, law firm, marketing specialists, continuing education, networking, and safety programs. One of the most unique features of the EPA is the various industries that their members are a part of – ranging from florists, D.J.’s and wedding planners, to inflatable operators, venue owners and corporate planners (among many more!) Today, over 4,000 members belong to the EPA (and counting!) and live and work all over the country. The EPA is currently adding chapters in Denver and Cleveland. Sarah: Please tell me a little bit about your background as an event planner. Was it a career that you originally intended to pursue, or was it a career choice that just sort of happened (so to speak). In addition to event planning, have you had previous careers? If so, what were those careers, and how did they help you as an event planner? 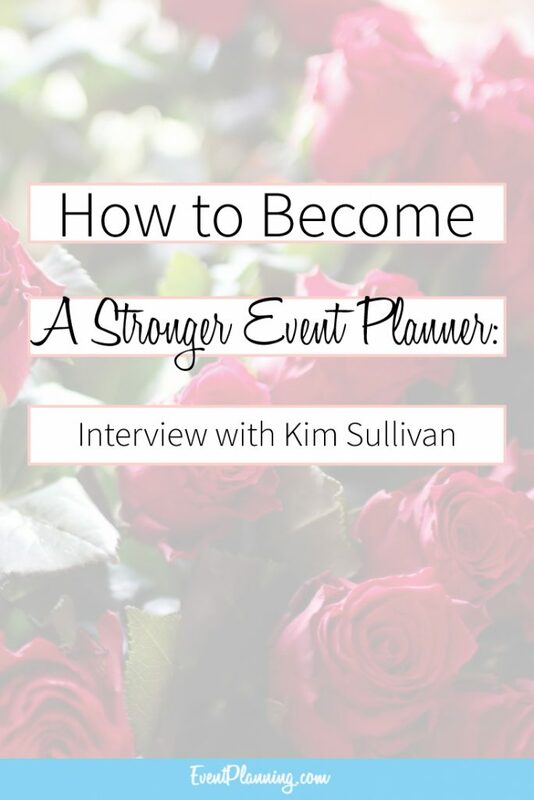 Kim Sullivan: Event planning was not a career path I intended to venture down. My background is in advertising and marketing. After 20 years in that industry I took a job with an entertainment company which managed Christian musicians and authors and handled music production for events worldwide. My collective experience left me with a desire to empower independent business owners in the event industry. My goal is to help them gain the knowledge, skills and mindset needed to build the businesses of their dreams. Sarah: What inspired you to create the Event Planners Association? Can you tell me a little bit about the history of the Association? KS: The Event Planners Association was created in 2005 as a service association. The goal was to offer much needed business services to independent business owners in the events and amusement industry. Our in-house law firm and in-house insurance agency allowed us to provide members with the specialized contracts, liability waivers, rental agreements and other documents as well as the proper insurance they desperately needed. Our close relationship with industry insurance carriers allows us to advocate on behalf of our members and enable us to get them what they need to be protected. Internet marketing was the third component included with EPA membership. Our online directory allowed members to be seen by potential clients. The EPA quickly gained a following and has well over 4,000 members nationwide. In the last couple of years we have had an overwhelming demand for education and networking. Those elements are being developed now with chapters launching all over the country (soon throughout the world) and an amazing educational program in the works. What started as a service association has evolved into a full-service support system for independent business owners involved in all aspects of the event industry. The EPA is essentially a support system designed to empower business owners. Our goal is to help business owners succeed! Sarah: he Event Planners Association has chapters all over the country. Where are the different chapters located, and are there any new areas where you would like to open chapters? KS: The Event Planners Association has launched four chapters since October 2011. They are located in Southern California, Chicago, NYC and Washington, DC. We are launching Cleveland and Denver next week and have Phoenix and Raleigh-Durham coming up behind those. We have another 15 in various stages of development throughout the country and are inundated with calls and emails from event professionals around the world wanting to start or join chapters. We interview potential leaders carefully to determine their qualifications for these leadership opportunities. The EPA will continue to develop chapters throughout the world to provide event professionals the ability to connect and plan events worldwide. Sarah: The Event Planners Association is known for having members in nearly every field in the event planning industry. Have any of your members planned particularly unique events, and if so, what were some of the challenges they faced? Furthermore, have you yourself planned any particularly unique/tricky events? KS: Members of the Event Planners Association cover every aspect of the event industry, from planners of every kind to musicians, venues, caterers, promotional items, bakers, dj’s, florists, inflatable operators, tables/chairs/tent rentals and everything in-between! EPA members plan every kind of event imaginable and have the Association and other members for reference when they get stuck with odd situations and challenges. Sarah: One of the key factors for any successful event planner to have is great networking skills. Do you have any advice on how event planners can improve their networking skills, as well as how networking came to be one of the most important factors of the EPA? KS: It truly takes a “village” to execute an event and it is through the connections with others in the event industry that an event comes to fruition. Event professionals essentially work in clusters, referring business back and forth among each other. Business owners work with people they know, like and trust. Good networking skills and opportunities are crucial to not only building this network, but expanding it. An event planner must have a number of “go-to” people they can trust to deliver on everything from venues to photographers, from florists to linens, etc. We have seen amazing relationships develop from our networking events. Our chapter events are designed to develop and nurture the relationships among event pros in a geographic location. With chapters across the country, we are now seeing referrals taking place nationally as well. The goal is to have event pros work together to build their business together. There is certainly enough business to go around and we believe it is better to embrace and empower each other than to have an adversarial relationship. To be an effective networker, a business owner must be willing to develop a sincere relationship with someone. As I mentioned, we all work with people we know, like and trust. We can provide amazing opportunities for those in our “network circle” and vice versa. It’s all about the relationship, performance and professionalism. That old saying, “you get out what you put in” definitely applies to developing a network/relationship. Sarah: Continuing education is also another key factor in the success of any event planner. What sort of continuing education programs would you recommend to event planners, and why? Are there any continuing education programs that are specific to certain event planning industries (such as wedding planners) that you would also recommend? KS: Education for a beginner and continuing education for seasoned pros is a must. It’s important to invest in yourself and your business with education which will broaden your knowledge and skill base. Education can be the difference between the success or failure of an event professional’s business. While there are no real standards for education in this industry, there are many great programs offered via major universities, community colleges and online. Additionally, we are working with some of the most innovative professionals in the industry in creating continuing education programs that give business owners the knowledge and skills needed to build a business. Sarah: In your opinion, what are some of the keys to success for event planners? For instance, how important is it for event planners to utilize marketing services? Or would you recommend that event planners learn how to market their services and events on their own? KS: Aside from the obvious skills related to event management and creativity, at the end of the day, a business owner MUST learn to market themselves. As an entrepreneur or as an employee, you are continually selling yourself, your services and your abilities. As a marketing professional, I always suggest business owners develop business and marketing plans (if they haven’t already). Our blog contains information to assist with this. I think there are a few essentials to marketing an event business: know who you are and who you are not, know your target market and how to reach them, develop a good, clean website (there are template options available or a webmaster can be hired), develop a blog and consistently create interesting and informative content designed to make you an expert in your field, and network, network, network. These are just the very basics of marketing. Marketing education is an area we focus on as most people are not natural marketers and need guidance to compete in this arena. Sarah: As a prominent member of the event planning industry, are there any event planning blogs/publications that you particularly enjoy or that you would recommend to our readers? KS: Of course, I love our blog and newsletter (laughs), but I also think there are some good publications out there. Some that I like are Special Events Magazine, Bizbash, Event Solutions and Wedlock Magazine. Pinterest is fantastic for inspiration too. I also think planners should be taking time to get inspiration from other places such as museums, window shopping expeditions, restaurants, etc. Read magazines outside of the event planning industry – anything that is interesting to them; fashion, design, gardening, etc. A planner must nurture those creative juices! Sarah: And finally, as a prominent member of the event planning industry, are there any current trends in event planning that you predict will be popular in the next year? For instance, macaroons have begun to surpass cupcakes in terms of quick and delicious sweets at events (although cupcakes are still quite popular). Are there any future trends such as these that you predict? KS: We are seeing a variety of trends and yes, we agree that macaroons are quite popular. We are still seeing candy buffets and cake pops gain in popularity. Destination events are popular as well. What’s interesting is that trends we see on the west or east coast tend to take a bit of time to make their way throughout the country, so what we may think has become passé is just getting attention in another part of the country. This is an opportunity for event pros to take advantage of the trends. Thank you so much for taking the time to speak with us Kim! And for more information on the Event Planners Association, you can visit EventPlannersAssociation.com! For inquiries, please contact us at editorial at eventplanning.com. hi my name is richard. i am only 19 years old and my dream is to do big events and all i got is a high school depomia i graduated in june 2 2012 and i really want to find a job doing a event planner my dream job is this to become a event planner and i have experience with event planing because i work at the Best Westen Sunridge Inn and i do events in there and i have done a couple of my own events so plz help me make my dream come true. Great interview Sarah. Kim Sullivan is doing great things over there at the Event Planners Association.